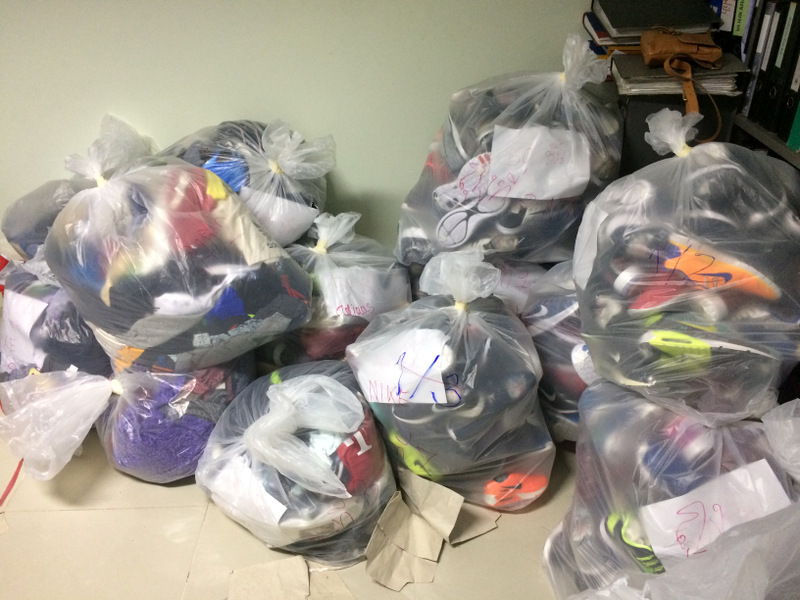 PHUKET: Officials who carried out a series of raids in the tourist-popular Patong Beach area have reported in a matter of hours to have seized more than 10,000 illegal trademark items with an estimated street value of more than B20 million. 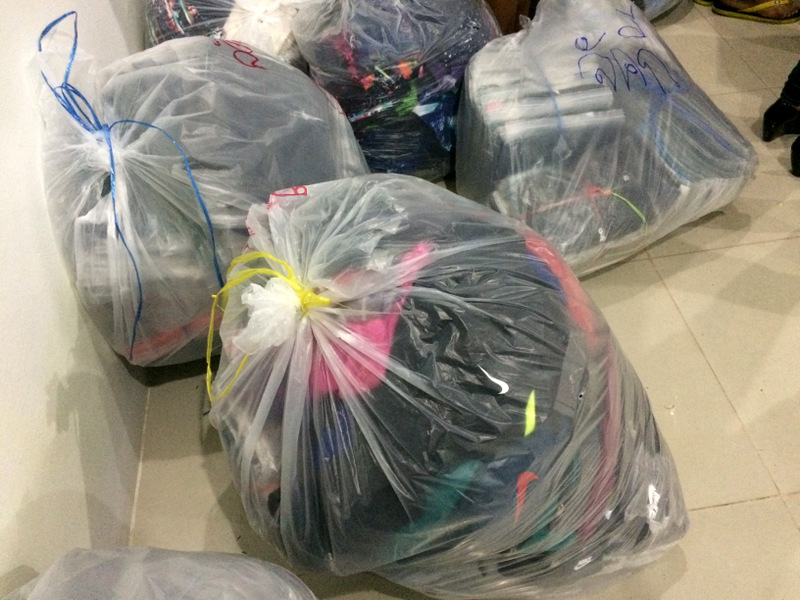 The monster haul of illicit goods were announced at a high-profile press conference held at 8:30pm last night, after the raids on 10 locations in the beach resort town were launched at 4:30pm yesterday afternoon (May 18). 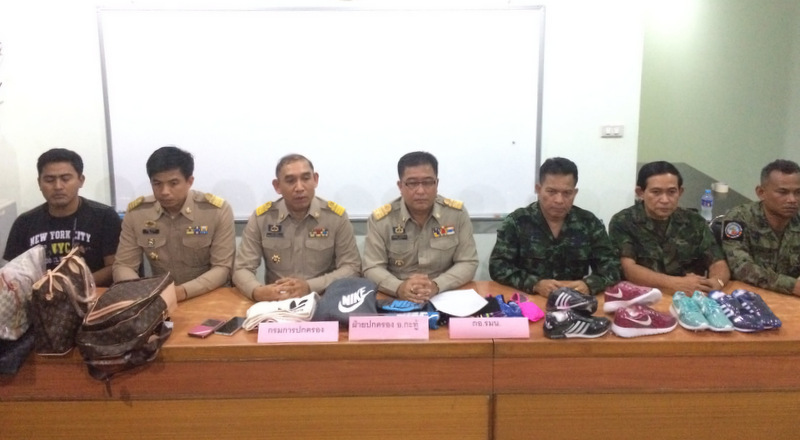 Present to tell the the press about the raids were no less than Col Anan Yuprasit of the Phuket office of the military’s Internal Security Operations Command (ISOC) national security agency. Hailing from Bangkok were Mana Simma, chief of the Criminal Case Investigation Division of the national Department of Provincial Administration and officers from Department of Intellectual Property. Also present were local officials Kathu District Chief Sayan Chanachaiwong and Lt Col Saksan Khomsakhorn of Patong Police. It was not revealed how many officers were used in carrying out the raids, or specifically which shops were raided. However, the officers did announce that 10 “alien suspects” had been arrested and charged for selling counterfeit trademark items, but did not name any of the suspects or identify their nationalities. 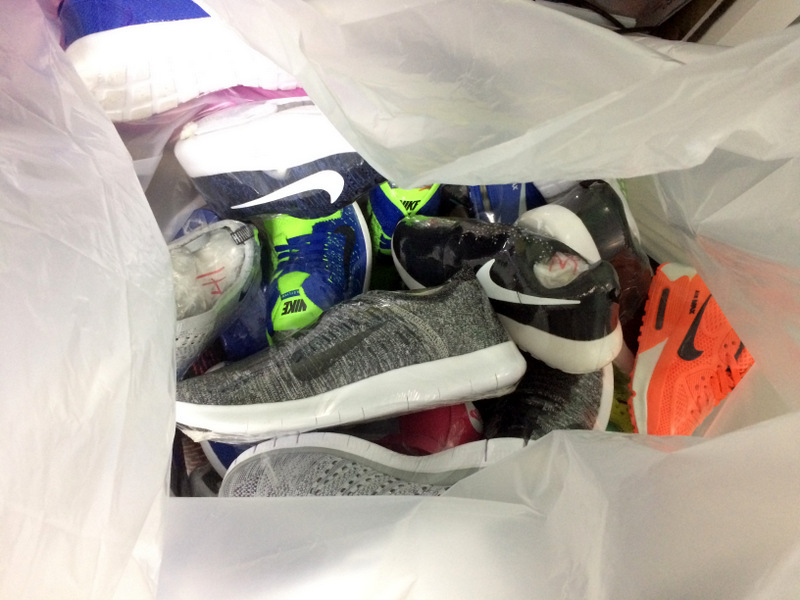 The officers did report that most of the 10,000 items seized were counterfeit brand-name bags, shoes and clothes, including brands such as Nike and Adidas. 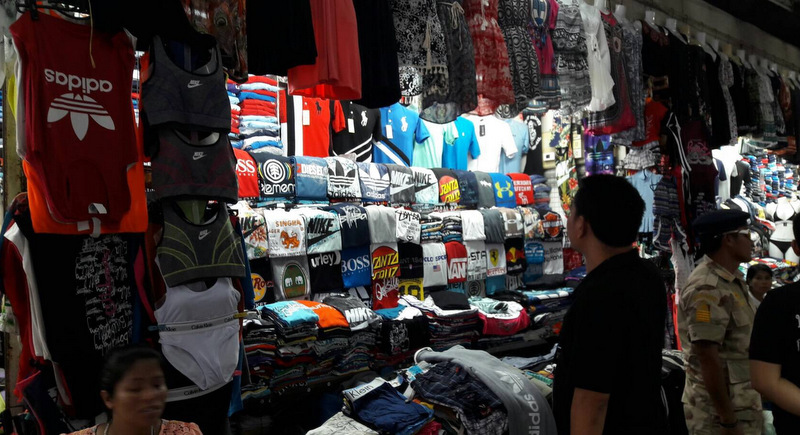 “This raid and seizure of illegal trademark items being sold came after we received reports from owners of the trademarks that copies of their goods were being sold in Phuket, especially in Patong, which is a ‘red area’ for counterfeit copyright goods,” Mr Mana said. “Patong is one location in 21 provinces in the Internal Security Operations Command plan to protect against and to suppress intellectual property infringement,” he added. “I want to warn other people who sell illegal fake trademark items that if they are caught, they will face legal action. This affects the image of the province and the nation,” he said. 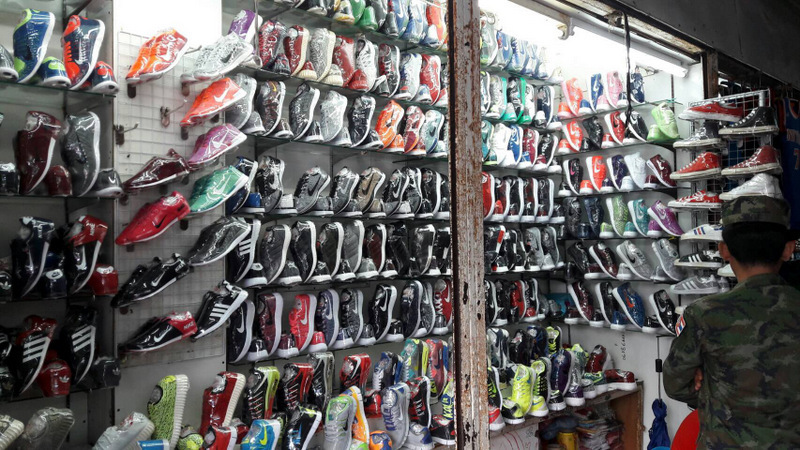 “Officers will continue their raids to eradicate all illegal fake trademark items,” he vowed. “The owners of markets and other buildings (where such goods might be sold) will be called in to be informed about selling illegal trademark items and asked to cop-operate by keeping their eyes on this – and to not to let any illegal trademark items be sold in their places.” Mr Mana said. 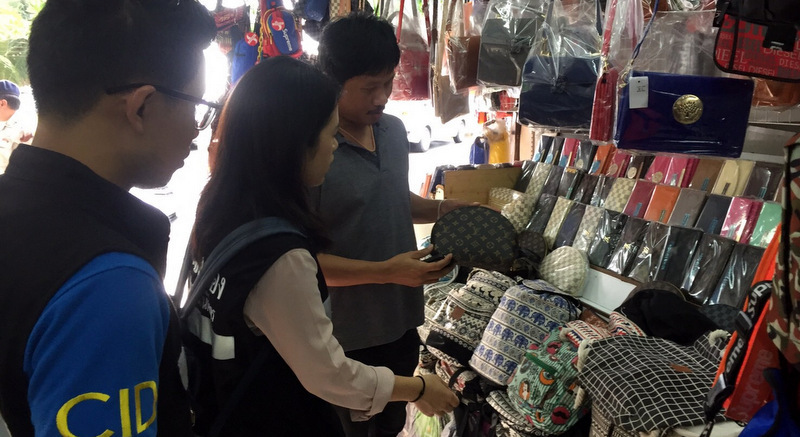 However, despite the high-brow press conference, specifically regarding the Patong raids, no officials made any mention of any attempt to identify who hired the foreigners to sell the fake goods or any attempt to track down where the fake goods originated from. A short while ago there was a happening, thai people were asking the thai Phuket official questions. The official  answer was; "You don't need to know"
This official completely forget that he is serving the thai inhabitants who asked him questions! Eagle reaction that thais are not concerned or curious about happenings is complete untrue. Eagle, don't keep focussing on me. Why are the thai officials, who are nation's servants, not giving this information to thai citizens? From behind their desk, talking to the press they don't know on forehand who reads it or not. Swerv; If any non Thai decides to migrate to Thailand, obtain permanent immigration status, maintain a family, property, income, pay taxes etc. That makes them a resident citizen not just a guest, it's the same for any country, Thailand is no exception. For eagle: I am a permanent resident, for me that is the same as being a permanent citizen. You are swerving around and reacting about nothing. May be other readers understand what you mean with your writing about ...neighbors sleeping rooms? Keep yourself together. Don't sell nonsense. Kurt: As has already been pointed out to you by others, you are NOT a Thai citizen you are a guest in this country. You have very little rights and demanding to know certain facts from officials who don't want to give out that information is nothing to do with you. Singapore again? This is Thailand not Singapore, respect the country or leave. The usual silly comments from commentators rueing the absence of a Police state. swerve; If thai officials withhold this info I am suspicious. If a press conference is announced I expect openness from officials, like in Singapore. No hidings. We not talk here about tanks or submarines. It is the right thai people and foreigners have as a permanent citizens. Everything around us is 'our business'. A good government services citizens. Kurt: Why do you want to know what their nationalities are? It's none of your business. Many Nepalese work in shops here, plus Burmese and Cambodians. They can and do work here legally. What nationality are the hired foreigners? Is the shop sales assistant job not 'for thai only' , like waiter, hairdresser, driver, etc? No officials made any attempt to inform public during press conference who hired the foreign sales assistants? Let me guess. Just a question? Could it be possible that thai officials are shop owners? 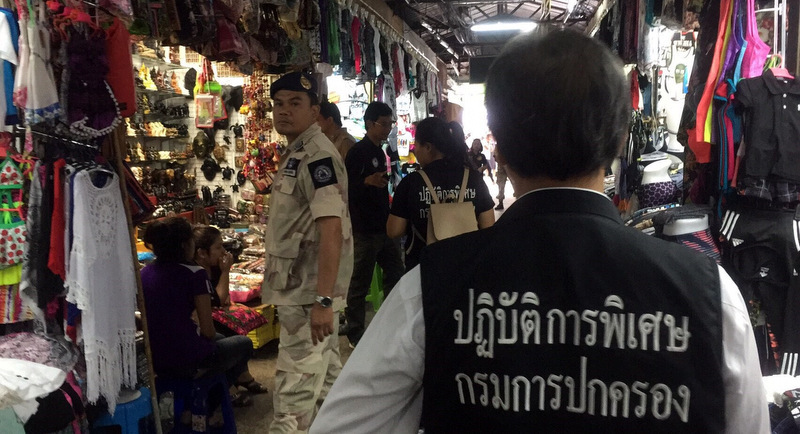 I see this "clampdown" still happens once a year or so, the authorities then go back to BKK and the counterfeit items go back on the shelves, its a farce for those who have lived long here and seen this ritual. If counterfeit good were taken away on mass, there would be nothing on sale anywhere bar Jungcelyon and a few brand shops. Its the same with drugs. They catch the small fish, the sellers, but the big fish just swim away... wrong approach. Evdryone knows they do not really want to eradicate is because to many big guys are involved to make money out of it. This must come as a big surprise to the Thai authorities....fake goods, on sale in Thailand, there must be a mistake. Thinking about it:  When I own  shop premises, than rent it out to someone who only sells counterfeit goods,  do I violate the thai law? These crack downs are not serious, just done once in a while to silence international branded producers who complain to their governments about these sales all over Thailand. Tomorrow counterfeit business as usual as always after every 'crackdown'. A B2,000 average per item seems pretty high. The usual once in a while officials action. The emptied shells in the shops will be stocked again tomorrow with the same stuff. The import flow continues ( how is that actually possible?). What are the legal actions sellers face? A fine of 500 thb?